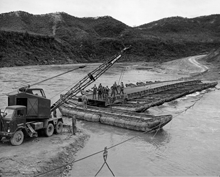 Members of the 1437th Treadway Bridge CO, US 8th Army, erecting a floating bridge during the Korean Conflict on Route #3-D after the flooded roadbed washed out. Temporary bridge building was and is essential to military campaigns. When we think of combat, though, bridge building is not the first activity to come to mind. Nevertheless, without the capability, most campaigns would fail utterly. So it is with organizations undergoing dramatic change. They must take on responsibilities that they don't consider to be in the usual course of events, and they must construct policies and procedures that will not endure. These activities are necessary when we take on the challenge of organizational change. Photo taken July 8, 1952, courtesy U.S. Army Corps of Engineers. In Part I of this exploration of the challenges of Change, we examined two sources of difficulty — sources internal (our emotions) and source external (outside pressures). This time, we explore issues related to planning. We'll look at three sets of reasons why planning change is so difficult: unexpected linkages, unexpected detours, and the need for temporary bridges. Linkages between organizational elements are often informal and unaccounted for. When an unrecognized linkage exists, changing one of the linked elements requires that we deal with the other linked elements. For example, when one group is physically situated close to another, friendships and associations form. Some of those connections might be channels for ongoing knowledge exchange. Separating the two groups by moving one group to a distant location can stress those connections, degrading performance. Relocating them both together might be preferable. If we break linkages we don't understand, change can be hard. A plan to move one group might seem perfectly sound, but it can fail if it doesn't recognize the importance of bonds between people. What might seem like resistance could actually be the result of interrupted knowledge flow due to breaking connections. At times, only after we begin executing a change plan do we recognize some factors we neglected. When this happens, with a little luck, we can make adjustments and continue. But sometimes we have to stop or backtrack, replan, and begin again. For example, in an acquisition, if we intend to relocate the acquired IT department, we might find that relocation is impractical because key people would require financial assistance with real estate issues. And keeping those people in place might also incur unsustainable costs. The department relocation plan wasn't defective, though it didn't anticipate real estate market conditions. If a plan is incomplete, change can be hard. The people involved might not be resisting change — they might actually have legitimate issues that the plan didn't anticipate. factors we neglectedencounter or anticipate difficulty, we might not be able to change systems directly from their current configurations to the final configurations we seek. Sometimes, we must build temporary bridges. For example, in the IT relocation problem, the organization might become a lender, investor, or loan facilitator, to enable people who are relocated to secure mortgages for new homes. Plans that include interim configurations that we intend later to abandon aren't necessarily defective. And the people whose needs we're accommodating in this way aren't making trouble — they have legitimate needs that we must somehow address. Unless we can be flexible enough to find temporary bridges, change can be hard. Would you like to see your comments posted here? rbrenpuqSjwvmLHOXBWKbner@ChacMmcmZNhFjUSYsPCcoCanyon.comSend me your comments by email, or by Web form. I offer email and telephone coaching at both corporate and individual rates. Contact Rick for details at rbrenvoqDEeicvPbSRqogner@ChacoaOaSPZQuGfuKawNoCanyon.com or (650) 787-6475, or toll-free in the continental US at (866) 378-5470.